Hi everyone. Today is the launch of the new CAS Watercolour challenge for April. This is such a pretty colour combination. I started by heat embossing this pretty image in white on mixed media paper. Zigs were used to watercolour the flowers using a damp brush. I used a soft gray zig to outline the flowers, spreading out the colour with a damp brush. It seems to give the flowers a bit of a lift from the page. To finish, the sentiment was stamped in soft gray ink. We are excited to have Marcia (Marcia K Designs) are our Guest Designer this month. Marcia won our February challenge - Love. Welcome Marcia! I hope you'll have time to check out the challenge blog. There's lots of inspiration from our wonderful Design Team and our special Guest Designer. And I hope you'll come play along. 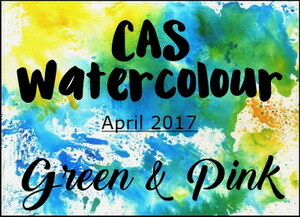 Just remember to keep you design CAS (Clean and Simple) and include watercolouring following our challenge of Green & Pink! Simply beautiful Green and Pink watercoloured Spring flower design, Loll. I love your Zig coloring and your grey shadow effect for more dimension. TFS my friend. Hugs.. Your roses are so pretty, Loll! And, perfect in pink! You did a beautiful job watercoloring them with your Zigs and I love your soft gray sentiment! I can't wait to play along again this month! Pink and green, one of my favourite combos Loll, such a pretty card! Gorgeous card Loll. That is the perfect hues of green and pink. Love the vibrant pink and green. The grey shadowing definitely gives them a lift - on first glance, I thought you'd fussy cut them. That gray created such a beautiful, subtle shadow! I will have to try that too! Love your gorgeous shading and glorious, spring colors Loll. Beautifully done! SO pretty, Loll! I love the delicate look of your coloring on these delicate looking blooms - simply beautiful! Your pretty flowers do seem to lift off the page, Loll! Love these soft spring flowers! gorgeous...love the soft pinks on the flowers mf. gorgeous Loll, such soft hues and beautiful shading. Beautiful colour combination as shown on your card, just Gorgeous. This is so gorgeous Loll. Looks like they are made of vellum. Once again I was speechless! This card is amazing! I love the intense, but also the delicate roses and the beautiful juicy green. Flowers are painted in an amazing way. Flakes are like the sunlight, the places are brighter, the places are darker. WOW! Amazing appearance. You are OK? I thinking of uou very often, my dear friends. Oh, Loll! This is gorgeous, and I had to look twice to see what flower this was...beautifully watercolored and such an elegant card! 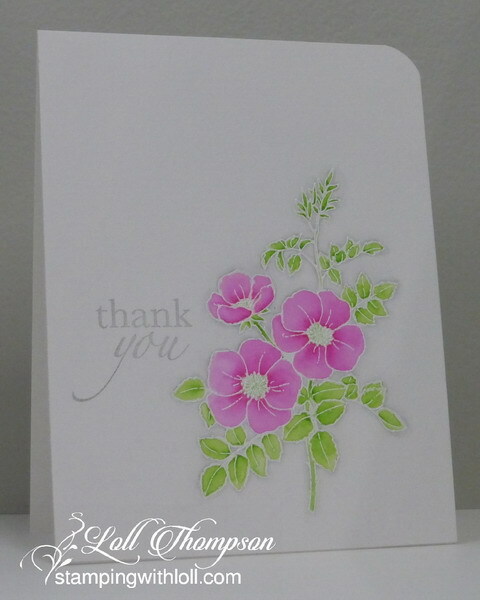 I hopped over from Karen Dunbrook's blog to the CAS Watercolor blog and saw your card! You are amazing! Hugs! WOW Loll, this is superb ! Your card is so soft and delicate ! I love your CAS layout ! And what a great combo of colours for this new challenge ! Thanks so much for sharing and for inspiring! How pretty and spring like! Love these shades of pink and green, and the grey outline makes the flowers pop! Beautiful!